Furious 7 led to especially unique experiences, some good, and one bad. Having the director, James Wan, so available at the start of preproduction was a first for me, and of course, it was a thrill to work on the Universal Studios lot and be let into the theme park rides, even though the Despicable Me: Minion Mayhem ride I worked on had not yet opened. Techvis was complicated, but allowed for production to shoot some incredible shots for the Dubai sequences. Paul Walker's tragic and shocking death, however, sent ripples through production. His accident occurred soon after I had transitioned to the Night at the Museum: Secret of the Tomb team, but the filmmakers did everything possible to handle his last major film with respect and care. 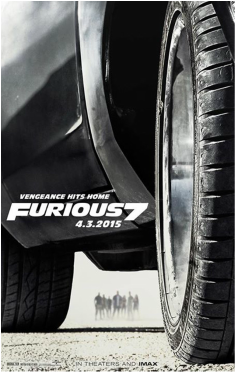 Furious 7 went on to become the fifth-highest grossing film of all time.